Patti Stanger, the famous “third generation matchmaker” staring on Bravo’s The Millionaire Matchmaker spent this past summer playing yenta with singles in the Big Apple. From Bryce Gruber, a sassy socialite and creator of The Luxury Spot, to David Yontef, a 39-year-old gay business owner who was exceptionally judgmental and superficial, Season Four in NYC had many interesting personalities. 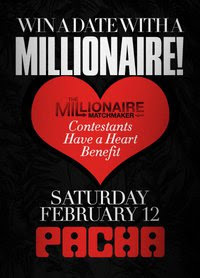 If this show is your guilty pleasure (I admit I am a little Bravo obsessed), you must attend the Millionaire Matchmaker Castmates Have A Heart Benefit tomorrow night at 10pm at Pacha. Millionaire Matchmaker Castmates Andrea Correale, PJ Marks and Michael Wachs will host a benefit for The Cardiovascular Research Foundation at Pacha's VIP room Pachita. The night will feature a complimentary open bar and Si TV Model Latina Winner Jessica Caban and Comedian Mike Baez will emcee a special auction and raffle to win dates with members of the Millionaire Matchmaker cast. And who wouldn't want to win a date with a millionaire? Order tickets in advance here. Or RSVP on Facebook. this would have been so fun! I'm a Real Housewives girl and just addicted to the Kardashian reality shows! Think of the delicous food, drink & presents you would get if you won a date with the Millionaire Matchmaker! Woo hoo!! Who would turn down a chance of love with a millionaire? The extra nice part is the benefit is raising funds for the less fortuante. Bravo for Bravo!